On 24 June 2017, the French President introduced a « new step after the Paris Agreement » to a group of internationally renowned jurists, with the aim to start working on a Global Pact for the Environment. Emmanuel Macron launched this high-level project at a Summit in September 2017 during the United Nations General Assembly. What is the Global Pact for the Environment? With threats to our environment increasingly impacting the survival of mankind and of our planet, it is urgent to act and build a sustainable future. Experts have highlighted a clear legal challenge: international environment law is fragmented in many conventions and international declarations. That’s why France offers the international community an opportunity to develop a single and more coherent text. The 2030 Agenda and its 17 Sustainable Development Goals establishes a link between the fight against extreme-poverty and the fight to preserve our planet. Harmonizing international environmental law, like the Global Pact is advocating, will make the implementation of the 2030 Agenda easier. The Paris Agreement addresses climate change. Adopting the Global Pact for the Environment would be a complementary step: it would help define the fundamental principles of international environmental law. Emmanuel Macron launched the Global Pact for the Environment’s project with a “launch summit” on 19 September 2017, during the UN General Assembly’s high-level week. This initiative launched by France will be open and inclusive. 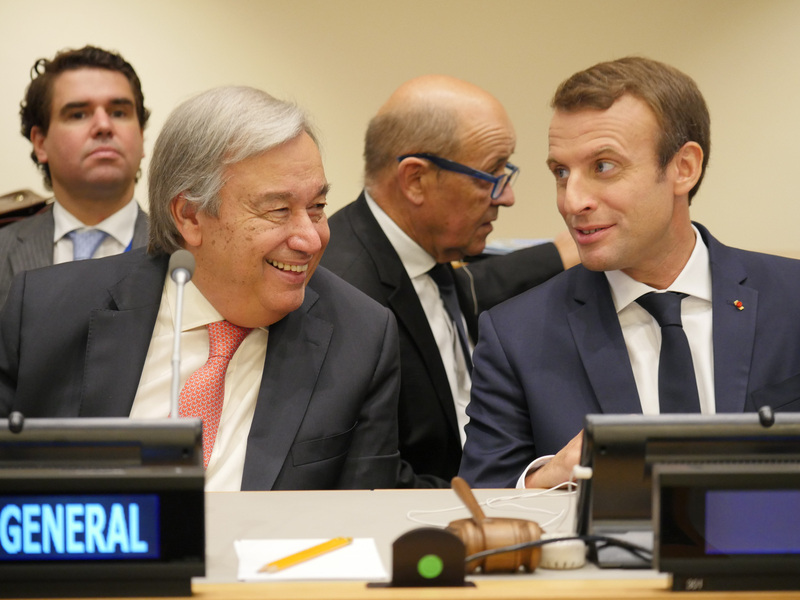 UN Secretary General Antonio Guterres and Laurent Fabius both attended this summit. All Heads of state and government and representatives from civil society and private sector were also invited to participate and support this initiative. The main summit’s objective was to launch an important consultation in order to elaborate the Pact. May 2018: Adoption of the resolution "Towards a Global Pact for the Environment"
On May 10, 2018, the UN General Assembly adopted by a very large majority the resolution paving the way for the negotiation of a Global Pact for the Environment. France welcomes the adoption of this resolution, which marks a decisive step in the mobilization of the international community for the protection of the environment. Adopted by a very large majority (145 votes in favor), the resolution received a hundred of sponsorships from countries, testifying of the strong adhesion to this project. France thanks the countries that have joined this initiative; it will continue to work with everyone in a spirit of gathering. In the face of the unprecedented deterioration of our environment, the Global Pact for the Environment will be an essential tool as it will create a space where the same environmental standards will apply to everyone, regardless of the country. This will facilitate international business processes and respect for their social and environmental responsibilities. Moreover, by its universal nature, the Pact will pave the way for the recognition of environmental rights as "fundamental rights" for all.